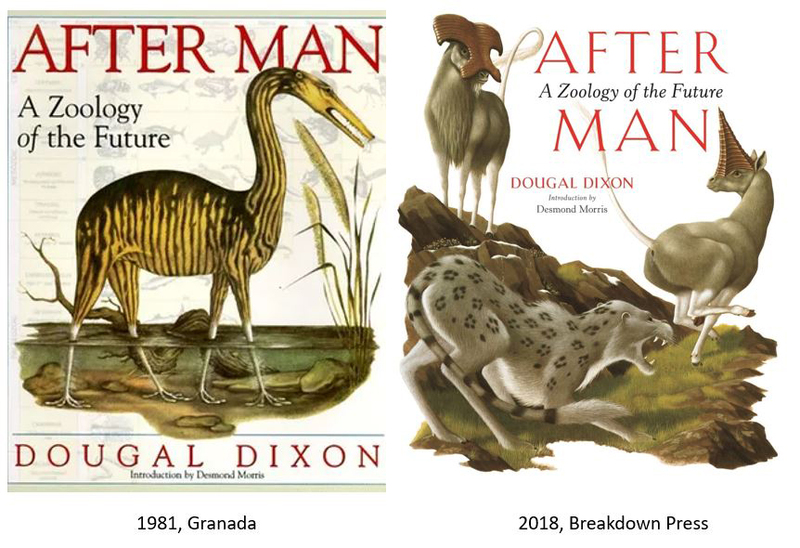 On September 11th 2018, I had the extraordinary privilege of appearing on stage with author, artist, editor, model-maker and visionary Dougal Dixon to discuss his famous book of 1981 After Man: A Zoology of the Future (Dixon 1981). 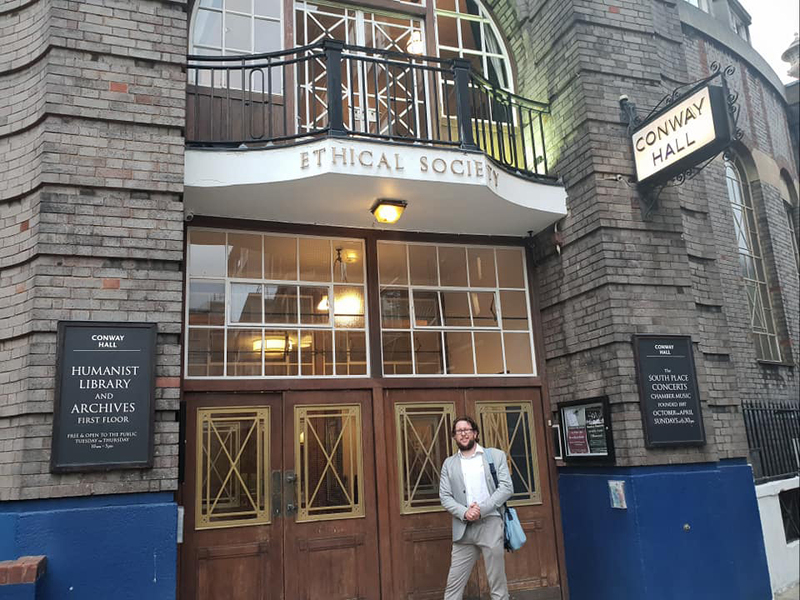 We were joined by more than 215 interested members of the public, effectively filling the venue (Conway Hall in London). At Conway Hall once again, such a noble venue. Image: Will Naish. 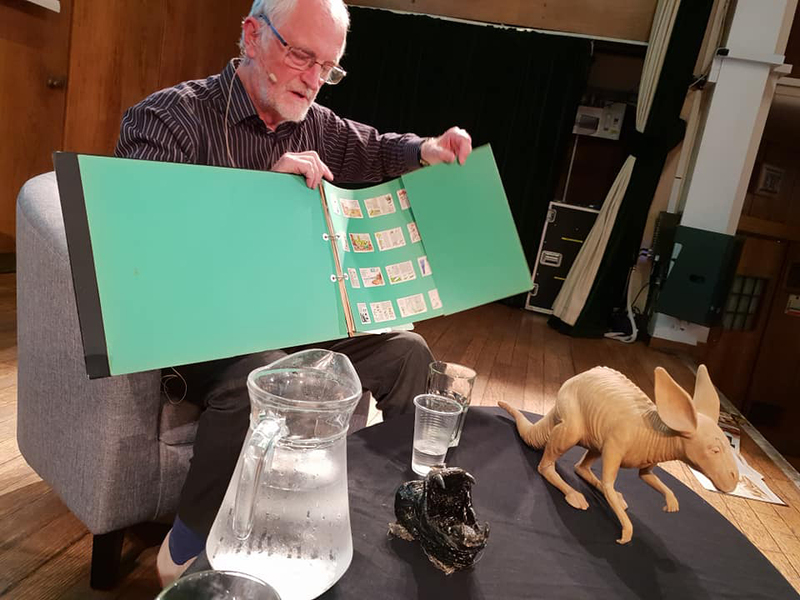 As you might have gathered if you’re a regular Tet Zoo reader, After Man has just been republished, and our on-stage event – hosted by New Lands London, and arranged by Scott Wood – also served as the launch for the new, 2018 edition (Dixon 2018). This was on sale and available for signing at the meeting. 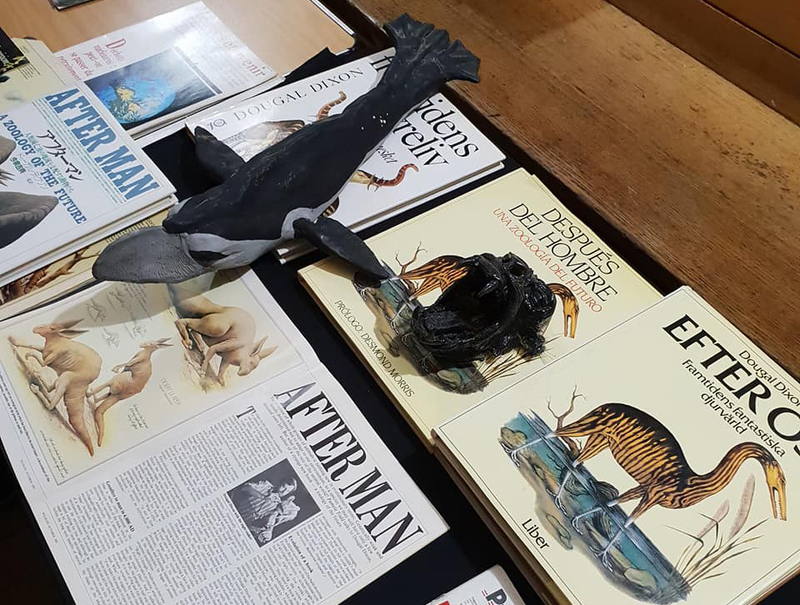 As you can see from these photos, Dougal brought along a treasure trove of material relevant to the genesis of After Man, including his original sketches, text, draft spreads and the original page plan for the entire work. The latter consisted of large card mock-ups with small, rectangular vignettes depicting the planned look for each page. Dougal explained how he took these documents along to two – yes, just two – publishers and immediately got the green light from both. Evidently, he knew exactly what he was doing. Dougal on stage, showing the original page plan for After Man. Small vignettes, showing the planned look of all the pages, are arranged in sequence. Image: Darren Naish. The original sketches are excellent and a testament to Dougal’s skill and planning. The quality of these illustrations also leave you wondering why it isn’t Dougal’s art that we see in the final book, and I impressed upon him during our discussion how fantastic it would be to one day see these unpublished illustrations in another book: a ‘The Making of After Man’ or something along those lines. We’ll see. Foreign language translations of After Man, a Vortex and Raboon model, and relevant magazine issues (like the October 1981 ish of BBC Wildlife). (c) Dougal Dixon. Image: Darren Naish. Several of the creatures pictured on the draft spreads were obvious prototypes of versions that made it into the final book but others were evidently abandoned at some point. A few of those ‘prototypes’ showed how the original animals had a different look relative to the published descendants: the bone-cracking Ghole Pallidogale nudicollum, to take one example, looked a lot more like a big mongoose in its original guise than is obvious in the book. Original text and original draft double-page spread for After Man, showing creatures inhabiting tropical grasslands. You’ll recognise some (but not all!) of the creatures as the prototypes of versions that made it to final publication. (c) Dougal Dixon. Image: Darren Naish. Dougal also brought foreign-language editions of After Man and a few models of After Man’s creatures with him, including a resin model of the Vortex Balenornis vivipara (a reasonable number were made, but it may be that this is the only one still in existence) and a wonderfully detailed Desert leaper Aquator adepsicautus. Alas, the Night stalker Manambulus perhorridus model pictured on the dustjacket of Dixon 1981 – the model I most wanted to see – is not in Dougal’s possession so was a no-show. Desert leaper model. For the handful of you that haven’t read After Man, the Desert leaper is a giant, desert-dwelling muroid rodent (in cases more than 3 m long) that undergoes significant fluctuation in fat deposition (and hence mass) according to season. (c) Dougal Dixon. Image: Darren Naish. As goes our actual discussion, we covered the backstory to After Man (some of which will be familiar if you know the interview I published at ver 3 back in 2014), the response from critics and reviewers and the many overseas trips Dougal got to enjoy as a consequence of the book’s success, the substantial interest from Japanese markets and the Japanese stop-motion and animated movies (we watched a short segment from the stop-motion movie, copies of which were given away on DVD to people buying the book), the various efforts by studios in Hollywood to get an After Man movie off the ground, and the connection between After Man and Dougal’s more recent project Green World (thus far only published in Japanese). Original sketches, by Dougal, of creatures illustrated for After Man. The animals were then re-illustrated by various other artists. (c) Dougal Dixon. Image: Darren Naish. We finished with a Q&A session and audience participation. Questions included the ‘new look’ Night stalker (yup… I shall say no more), Dougal’s thoughts on the future of humanity, how and which fossil species had influenced the creatures of After Man, and what might be different in After Man if Dougal were to write the book today. The Vortex model that Dougal brought along. It’s about 60 cm long. (c) Dougal Dixon. Image: Darren Naish. For a lifelong fan of After Man and Dougal’s connected writings, this event was an absolute thrill and I’m tremendously happy to have been involved. And judging by our audience’s response, it was enjoyed by everyone who attended too: thanks so much to everyone who came along and participated. Two final things are worth saying. Firstly, I was asked innumerable times whether the event was going to be recorded. Alas, I was simply unable to organise this or even remember it given all the other stuff I had to worry about, though I think (and hope) than an audio recording exists. Secondly, this is not the only Dougal Dixon-themed event of 2018! Dougal is also on stage at this year’s TetZooCon when he will be joined by Gert van Dijk (of Furahan Biology and Allied Matters) in a discussion on speculative biology. TetZooCon happens on Oct 6th and 7th in London and tickets are still available. Dougal will also be bringing archive material to that meeting as well! Darren Naish (l) and Dougal Dixon (r) on stage at Conway Hall, September 2018. Image: Will Naish. My thanks to Dougal for being such a brilliant person to talk to and for all the material he brought along, to Scott and everyone else at Conway Hall and New Lands for organising things and setting it all up, to the Breakdown Press people for the book selling, and to our brilliant audience for their interest, enthusiasm and participation. My writing and research is dependent on crowd-funded support. Thanks to those whose patronage made this article, and the others you read here, possible. Please consider assisting me if you can, thank you! Posted in speculative biology and tagged with speculative biology, Dougal Dixon, After Man, SpecBio, SpecZoo, speculative zoology, speculative evolution. September 17, 2018 by Darren Naish.